It had to happen whilst we were away, the car broke. 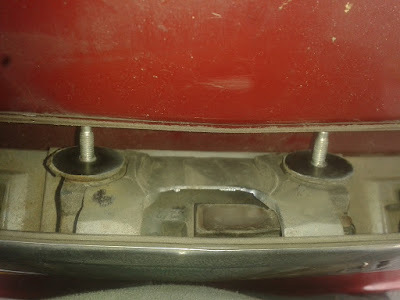 Not seriously but the electronic boot catch stopped working, a bit annoying when you're on holiday and using the boot (trunk to the Americans) lots. Luckily it was just after I got all our luggage into the holiday house. Now I've got no idea why this catch is electronic as the switch is just above the catch and a button would do the job just as well, but I guess a button has less chance of going wrong so a repair is less likely, or maybe I'm just being pessimistic. Googling the problem showed it to be a fairly common fault with two options an easy fix or a tricky one. I hoped for the first one and checked the fuses under the bonnet and in the boot. None had gone, this meant it was the harder fix. I had to strip off all the covers to expose the switching mechanism. So I went and brought a set of screwdrivers and bits and set to work. 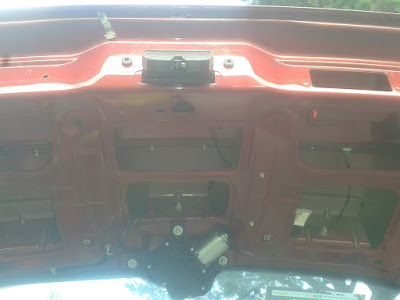 I used a large flat head screwdriver to manually open the boot and then it didn't take me too long to have it all apart so I could see what the problem was. I think that the switch was pressing against the metal work of the boot and this caused it to stop working. So using my girls scissors I cut some plastic spacers out of a yoghurt pot and put them in before putting it all back together again. It worked fine then and we could get the pushchair out of the car when we wanted - a big deal when you're on holiday with two little ones! It's funny because the thought of taking the car to the garage to get it fixed didn't even cross my mind and I'm sure my wife didn't even think to suggest it! It was a great holiday, and to be honest the fact that I managed to sort it almost added tot he experience! "What if you can't put it back together again?" He's never been beat yet. I'm not saying I've never been beat but it's best to have a try. I can google it, ask my brother , dad or cousin, I have lots of options before I'm beat! Nice. Nothing is better than beating them at their own game and fixing it yourself!!! Yeah, it feels good when it works! I know, but we were short on space. I'll have a little kit ready for next time! If you had taken it to a shop they would have wanted to put a whole new lid on the trunk and charged you twice what you spent on your weeks vacation rental for it. I learned long ago to never travel without a tool bag. Probably be best part of £200 fro what I did I should think as they would have replaced parts like you said. That would have put a dampner on things! Car is going to have a tool kit from now on! Resourceful as usual ... and so much more satisfying than handing hard earned cash over for a garage repair. Yep, cash stayed in my pocket! A tool kit came with my VW Golf. It's come in handy a couple of times. I don't leave home without it. Glad you tinkered out the problem with the latch! thats a good idea and I'd expect little less from a VW, alas ours is an Astra, we're lucky to have a jack!